Meanwhile, Tuesday's dinner was out. Last night I had a steak. Sorry, no pics, but it was a ribeye, sliced 1-1/2" thick. It ended up being a huge steak; I should have cut it in half, but...it was pretty good. I overcooked it, alas. I'll just have to try again. Alas, I haven't yet figured out how to use it! After last night's misfire, I am motivated to put it to use. I am sure you are wondering, what's the holdup? I am kind of a klutz at times, and without ample preparation, there's just that chance I'll actually manage to ruin this fine tool the first time out. So I've learned: read the instructions first! Now to today, around noon. 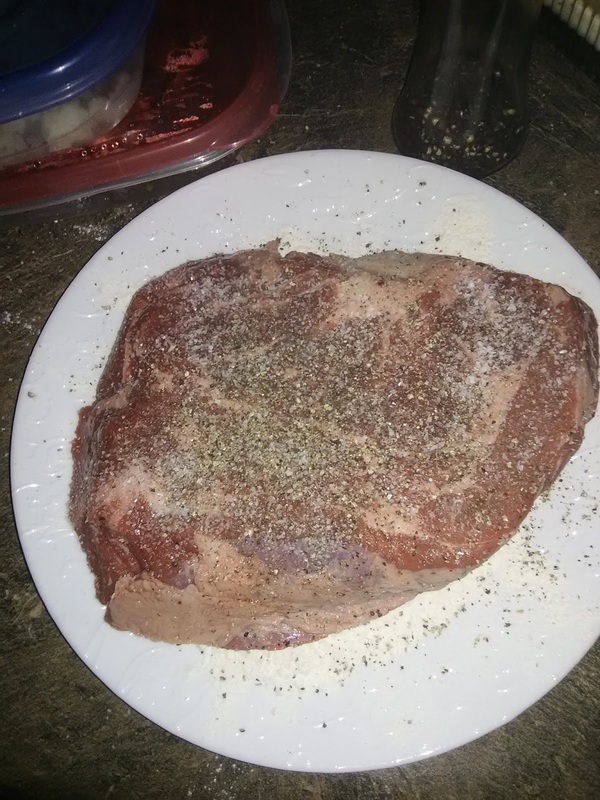 Meanwhile, I prepared a portion of Chuck roast, with plenty of ground pepper and coarse salt, and then dredged in flour. Don't be cautious about the seasoning! Go big or go home! Here, I haven't yet floured both sides. But when I did, this went into the sizzling fat. 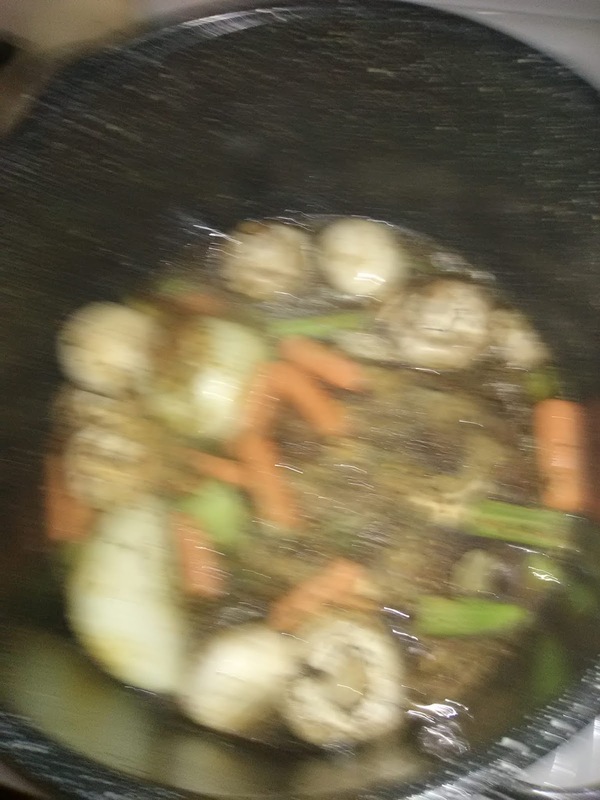 I tried to get a picture of the meat browning, but it was too dark and steamy. But what you want is to give the meat really good color. Color = flavor. After browning it all around -- even on the edges -- In went the vegetables. 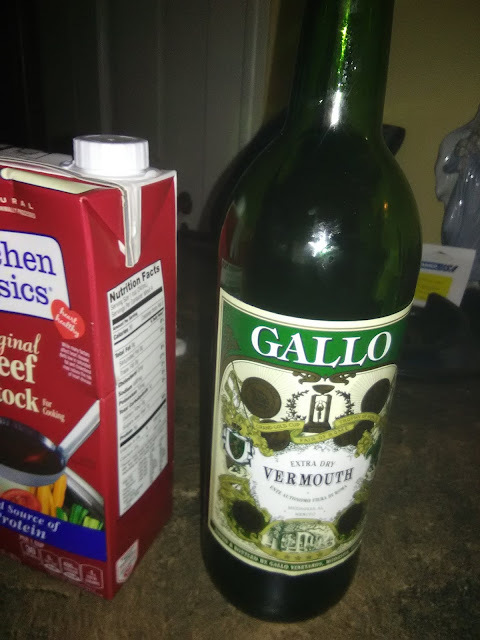 Then a container of beef stock, and about a cup or so of dry Vermouth. But any wine will do; but if you use a sweet wine, the sweetness will be concentrated. For whatever reason, I like white wine better for this, but I use anything leftover. This is especially a good use for dry Vermouth, unless you make lots of Martinis, because Vermouth is a wine, and once it's opened, it will slowly degrade. Excellent Martinis demand fresh Vermouth. 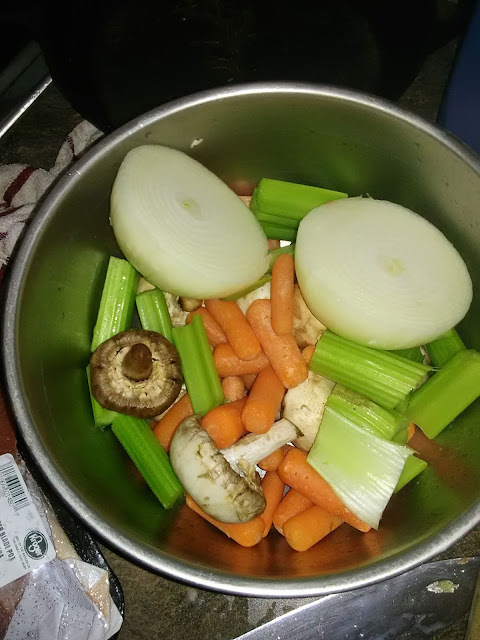 So here is the resulting combination, which will soon be Pot Roast. Also with this went a bunch of dried garlic. I mean, LOTS. Plus a generous amount of red pepper flakes, some Thyme, and some bay leaves. I might have put some Rosemary, but I didn't this time. Remember Smell-O-Vision? No, I don't either, but I didn't make this up. Anyway, I wish I had Smell-O-blogging, because the aroma of this dish has been absolutely wonderful. Better than I remember; I think I haven't used Thyme before. If this ends up tasting even half as good as it smells, I'm keeping Thyme with this recipe. 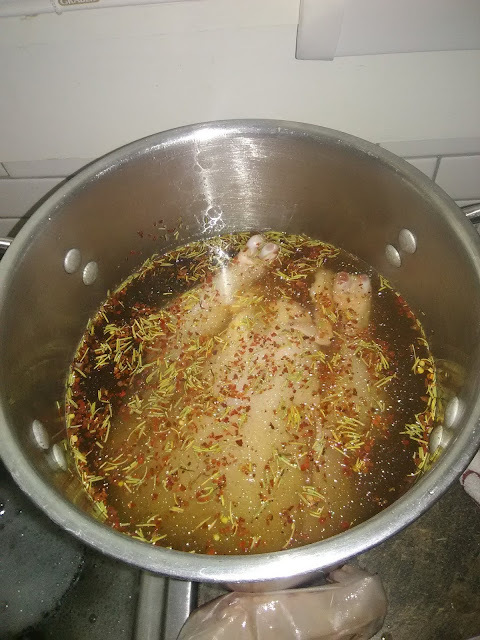 The goal is to get the skin dry. I think Saturday. At which time, I will resume my pursuit of chickeny excellence. (Should that be "chickenish"? "Chickenlike"? Discuss in comments.) As before, the prep will involve Rosemary, lemon, salt and black pepper, and either butter or oil. I'll try some of the ideas discussed and suggested the last time (see link in last sentence). By the way, does any of this seem fancy, or luxurious? All these ingredients (well, not the unpictured steak) are reasonably priced and readily available. And all this is really pretty simple, although it does involve some planning. Oh, in case you didn't guess at it: the mushrooms were also used with the steak, last night. Here's how I prepared them. I washed them (very important!) and sliced them, not so thin. I prepared a wide fry pan with olive oil and butter; got that bubbling. The temp was medium -- you don't want to cook these too fast or too high, or you'll burn them. The goal is to get some of the moisture out of the mushrooms, and make them the texture you like. Once those go in, I apply generous amounts of garlic. 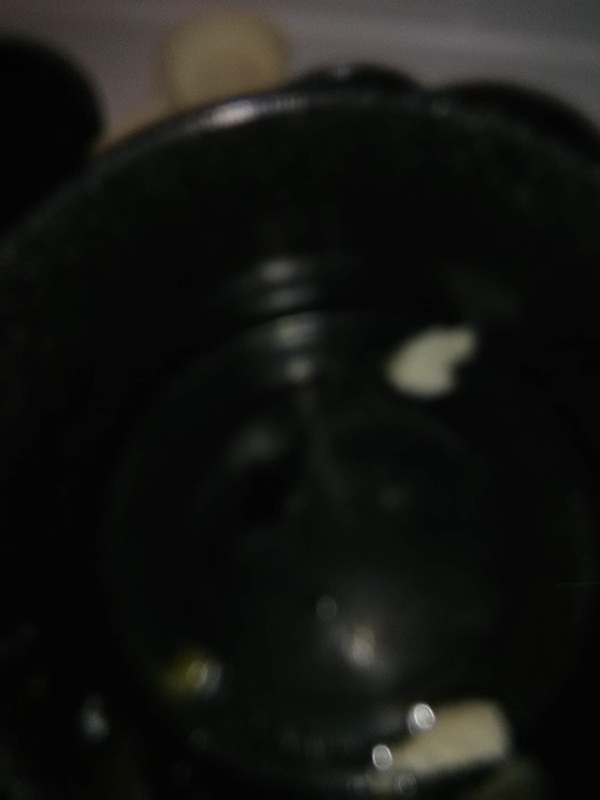 I use garlic powder, because it adds no more moisture. We want less of that. Also some black pepper and salt, and sometimes just a touch of cayenne pepper. All that simmers; I turn them over and stir them around, till they look right to me. About ten minutes, which you can easily do while your steak is cooking (another reason to keep the heat not so high, so you don't ruin them by being distracted too long), or even after, while you rest the steak. A delicious side with the steak! So, the pot roast is nearly finished. I just checked it -- oh, you're going to lick the screen when you scroll down to the picture I'm about to post! Be patient! Meanwhile, you may be thinking, couldn't I make pot roast in a crock pot? Certainly; but I don't own a crock pot, and to be honest, I don't really want one. I have too much stuff on my counter as it is (admittedly, several items I use rather less than I thought I would, such as the ice-cream maker; but oh, how nice that is when I do use it!). Even so, I don't need a crock. My dutch oven in the, er, oven, works just fine. What's more, most of the meals I make involve either the stove top or the grill outside. For example, had it not been so very cold, I'd have grilled my steak. 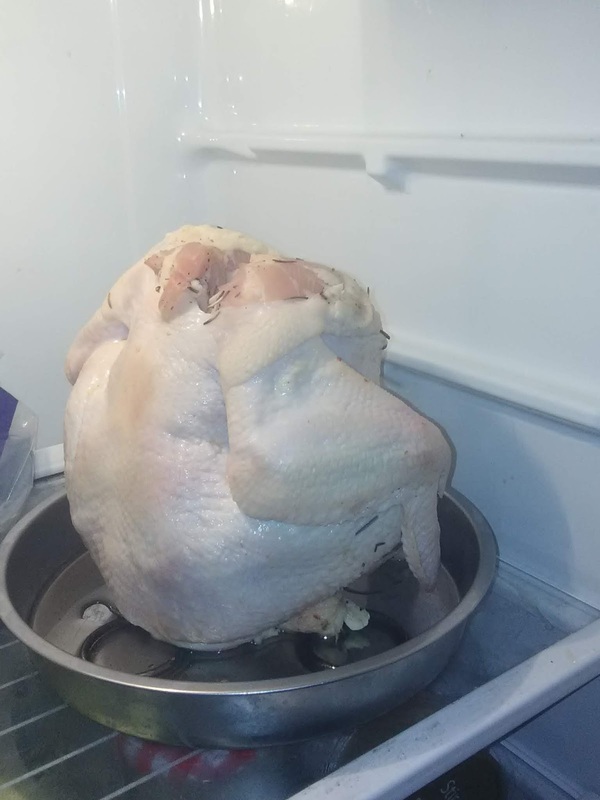 Instead I cooked it in the oven, finishing it on the stove top. And in case you're wondering, the reason I didn't cook outside isn't what you think. It wasn't because I would be cold -- because there is zero need to stand over a steak on the grill. Much better to leave it alone. Rather, the problem was getting the grill hot enough. The last time I tried to grill in bitter cold weather -- combined with sharp winds -- the grill didn't reach the temp I wanted; worse, once I opened it, it lost about 200 degrees instantly and couldn't climb back up. 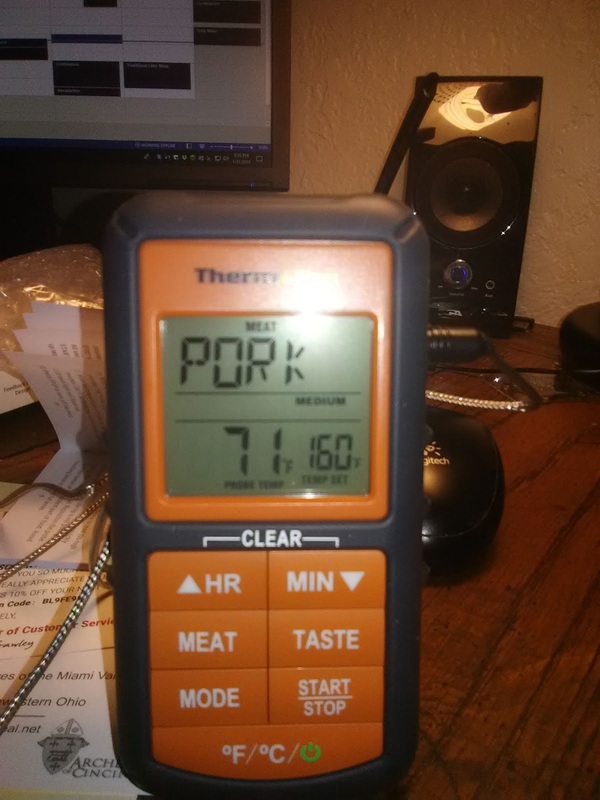 When I first powered it up, it started acting crazy, as if the meat it thought it was measuring the temperature of was being incinerated. Turns out the little plug in the side wasn't all the way in, creating a short. I also discovered it doesn't approve of me cooking pork medium rare, and so refuses to give me the suitable temperature. 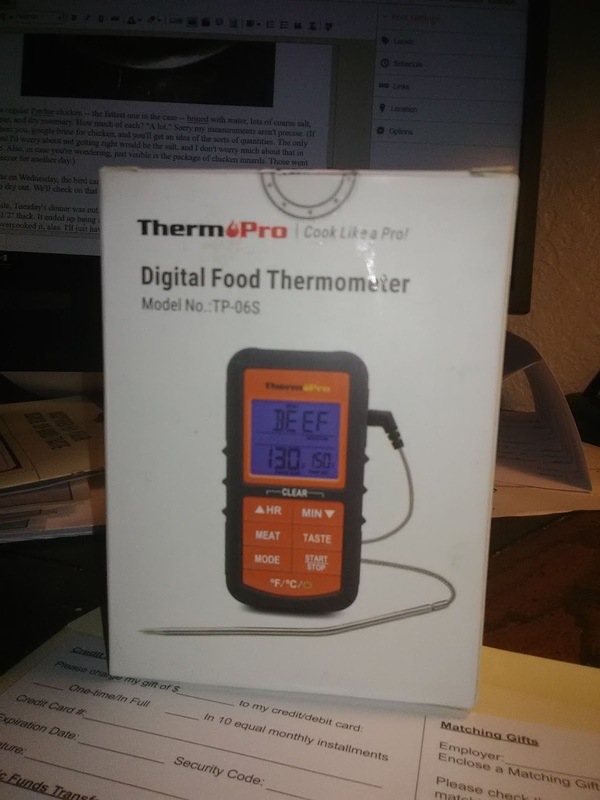 Don't impose your morality on me, Digital Food Thermometer! Stop licking the screen! That's disgusting! What you can't tell from this picture is how tender the meat is. If I wanted to, I could further thicken this gravy, but that means carbs, and I'm trying to avoid those. As it is, this has some flour, and the vegetables have some carbs -- so does wine -- but, overall, this isn't too bad, Adkins Diet-wise. And here is best part: leftovers! If I were having wine, I'd want something dry, maybe Chianti, or a Cabernet? Really, I'm not good at that sort of thing; especially as I usually just make do with whatever I have on hand. I like wine, and I'm always glad when the server at the restaurant can suggest the right one; but I'm not particularly good at doing that. 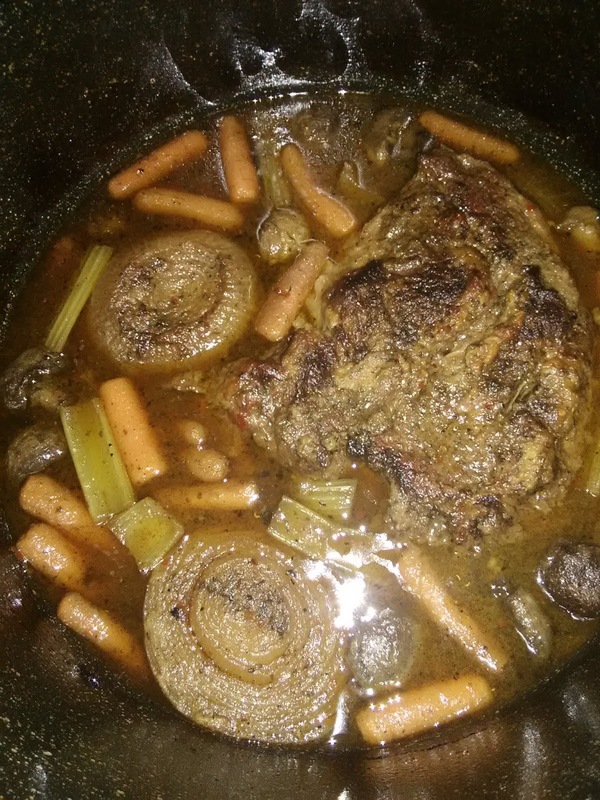 My best Pot Roast yet! I really did want wine with this, but all things considered, I decided to hold off. I have confessions and Benediction yet tonight. As it was, it still needed a little salt -- to my taste, anyway. More flour to make thicker gravy -- and maybe some bread and butter, or hot rolls or biscuits? Hmm. And since I used the Dutch oven, I easily could have tripled this recipe, and served this for a dinner party. Now that I have it just the way I like it, I think I'll do that. (I would probably back off the red pepper a bit; it's at the upper end of what I like, so it would be too much for some.) I may tweak it a bit, but I think this is where I want it. Wow, Father, that is awesome. 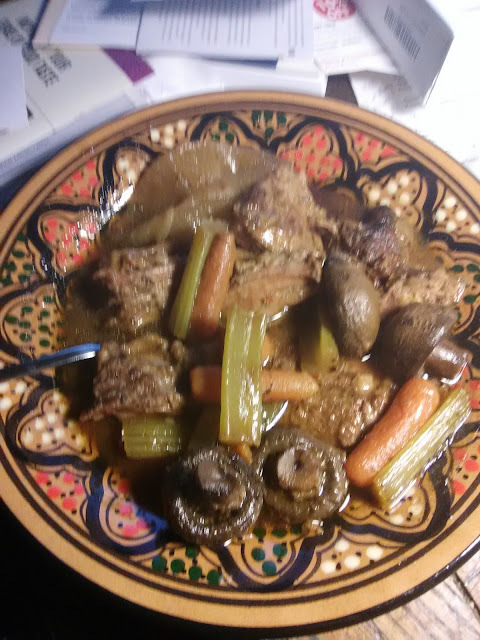 That pot roast looks like my Mama’s pot roast. Have you tried sous vide? If it wonderful for winter cooking when you can’t grill. The quest for a crisp chicken skin reminds me of the Peking Duck that used to be available in almost every Chinese restaurant decades ago. It had to be ordered a day in advance, it was all about crisp skin. Now I am hungry. Poor man’s sous vide: beer cooler that closes tightly, electric kettle, instant read thermometer. 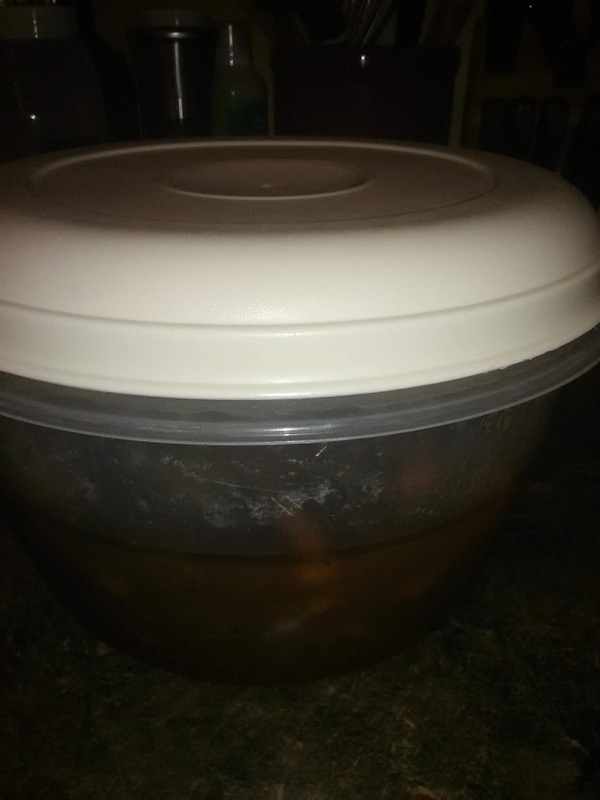 Put the room temp item in a ziplock bag, squeeze out the air. Heat water in kettle. Put a cup or two room temp water in cooler then pour in boiling water. Dilute with more room temp tap water until instant read shws desired temp plus about 5 degrees. Drop in the item to be cooked. Weight it down if you need to. Slam the lif with your instant read thermometer probe still in the water. Check it about every 15-30 mins and add more hot water if needed to keep temp at the desired temp. For meat you average two hours to cook so use the time to prep other stuff, play the piano with giests, mow the lawn, etc. at the appointed time sear the meat in a cracking hot skillet. Save juices and reduce with burre. It is a five star meal. Father, you’re getting better and better at this cooking gig! !